PRODUCT DESCRIPTION: Odorless material which is applied to the soil around plants, trees and shrubs which works as a systemic. 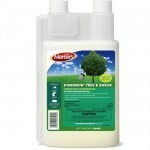 This formulation is designed for use on any tree and shrub including many fruit bearing species. WHERE TO USE IT: Inside or outside the home for shrubs and trees including several fruit and nut species. Now for vegetable or fruit plants, use the DOMINION FRUIT & VEGETABLE concentrate. RATE OF APPLICATION: Mixtures vary depending on the size of the tree canopy. See the label for specific rates for your tree or call for help in calculating. TARGET PESTS: Adelgids, Aphids, Japanese beetles, Lace bugs, Leaf beetles (including elm and viburnum leaf beetles), Leafhoppers (including glassy- winged sharpshooter), Mealybugs, Psyllids, Sawfly Larvae, Thrips (suppression) and Whiteflies to name just a few. We have European Hornets that are girdling a Mountain Ash tree and they are all over our apple tree (Macintosh variety) eating the fruit while it's still on the tree. Which of the Dominion sprays would be preferable for the fruit tree? The 1.47% concentrate says it is good for certain fruit species. Does that include apple trees? Or should we use the 0.235% Fruit & Vegetable concentrate instead? Go with the Tree and Shrub (the stronger formulation). This is preferred when treating trees but more importantly, when doing topical treatments instead of root injection. If we use Dominion Tree and Shrub product as a spray on trees, is it toxic to birds or small animals that hang out in the tree after we spray? No. In fact, once this active is diluted down to labeled rates, it won't pose any hazard to people or wildlife like birds, squirrels, etc. I have multiple trees which seem to be infected and wish to use the soil treatment around the tree to treat. Please advise on application and best product for such. I live in northern Minnesota have a young apple tree and a dog, if it matters. I could send a couple pictures if needed, but wish to try to save my trees and can treat regularly if needed. The treatment is simple. Basically you'll use a stake to create holes in the ground under the tree. They should be inside the drip line (tree canopy) and 1-2 feet down if possible. The amount you make will depend on the size of the tree and how much liquid you need to apply but generally 5-10 is usually plenty. The mixed solution is then poured down the holes so the chemical can soak into the soil and ultimately, reach the roots of the tree. As for which version of Dominion to use? This will depend on whether or not you plan on harvesting the fruit to consume. So for fruit trees that are bearing say crab apples which people aren't eating, the Dominion 2L would be the best way to go since its the strongest option. You can also spray it on the tree foliage to help reduce the current activity. This will reduce insect damage. Systemic action takes a good 1-2 months to get in place and have an impact so you don't want to wait that long given we're still in summer and damage is no doubt happening daily. Lastly, just keep the dog away when treating but once the application dries, pets and people can come into and on treated surfaces without any significant hazard present.